Marrow is another word for zucchini. I’ll admit it. I’m just being difficult here. For this month’s Tigress Can Jam post I could’ve done cukes. I could’ve done melons from as near as South Carolina (and now New York, as of my coop this morning.) We are bringing an organic Maryland watermelon to Fire Island today. 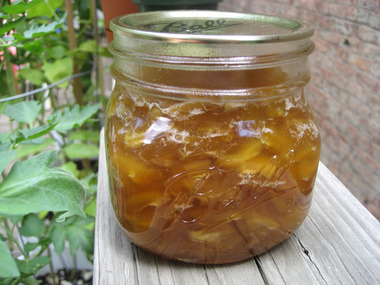 (You will see watermelon rind pickles in a week and some change.) Cucurbits are a broad family, with many options at hand. In hopefulness that one day I’ll have more marrow than we know what to do with, I turned these Into these Sweets made from zucchiniI did this because I wanted to know for sure, is this something I’d ever do in a time of true abundance? There were, of course, merits and surprises, as with all first-run canning operations. 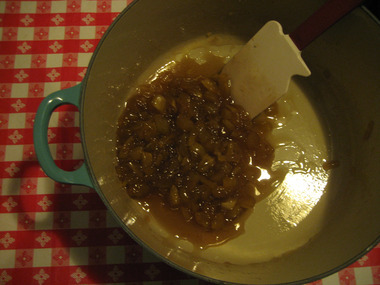 After doing as instructed by Ms. Ziedrich, I realized I’d accidentally made that delicious candy, those ginger chews with the odd texture, except mine are made with zucchini instead of solid sugar and gelling agents. I boiled my mixture bit too long; my syrup went past thread stage, somewhere closer to soft ball. 1. Use or make a spice bag for the ginger. Tie kitchen twine around a few layers of damp cheesecloth2. Combine all ingredients in your heaviest-bottomed, non-reactive pot and let sit for 24 hours. 3. Bring to boil over medium heat so any leftover sugar dissolves; raise heat to med-high and boil for about 20 minutes, stirring occasionally. 4. Remove pot from heat, remove spice bag and let preserves cool (about 30 min to an hour depending on how large your batch is.